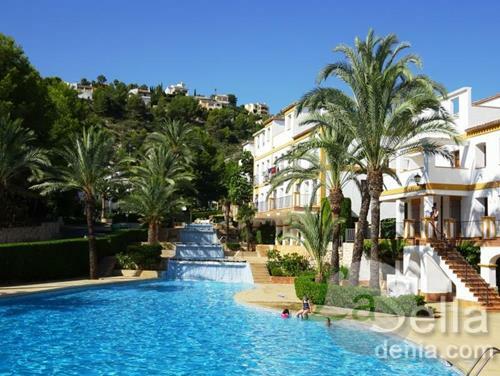 Delightful two bedroom ground floor apartment looking over the picturesque gardens and square of Urb Zarzas and walking distance of the local facilities of La Sella Residencial. Covered terrace overlooking the gardens, entrance door leading into the lounge/dinning/kitchen with beamed ceilings, traditional windows with wooden shutters and the kitchen having base and eyelevel units, electric hob & extractor fan. Hallway with storage cupboard, family bathroom, bath with shower over, wc, vanity unit housing the sink made from marble. Two Double bedroom with built-in wardrobes and one having french doors leading into a private Courtyard.